For women in India, their journey in the sports world hasn't been a smooth one. They have had to work twice as hard as the men to break free from the shackles of patriarchy and prejudice and stamp their own authority in the sports world. Many have even had to go against their own families to fulfil their longstanding dreams of bringing laurels for their country. In many instances, their achievements have gone unnoticed and they have had to wage a battle just for recognition. Despite all these hardships, Indian women haven't retreated. Rather more and more young girls have been inspired to take up sports in the past decade and help India in its bid to become a sporting powerhouse. Today, on International Women's Day, we salute the spirit and tenacity of all these brave women. Badminton in India has been taken to unimaginable heights by the country's two shuttle queens, Saina Nehwal and PV Sindhu. The two girls have been the leading light and the pathbreaker in every sense. They have not only smashed down the formidable Chinese wall but have even inspired their peers to give their very best. A series of firsts has been achieved by Saina and Sindhu which India could previously only dream of. 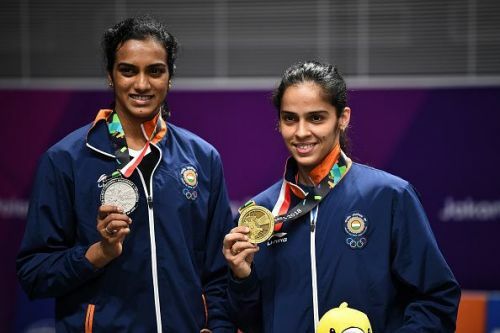 Thanks to these girls, India has two Olympic medals from badminton, multiple World Championships medals, Commonwealth Games gold medals, Asian Games medals among others. When Saina climbed to the pinnacle of the world rankings in 2015, it was the first time an Indian woman shuttler led the rankings and was indeed a moment to be remembered forever. Sindhu's BWF World Tour Finals win last year was the first time any Indian triumphed at the prestigious year-ending championships, showing how far the sport has progressed in the country. In doubles too, the likes of Jwala Gutta and Ashwini Ponnappa have excelled, bringing home a gold and a silver from the Commonwealth Games and a bronze from the World Championships. Ponnappa added another medal from Gold Coast Commonwealth Games alongside Sikki Reddy, swelling her resume further.